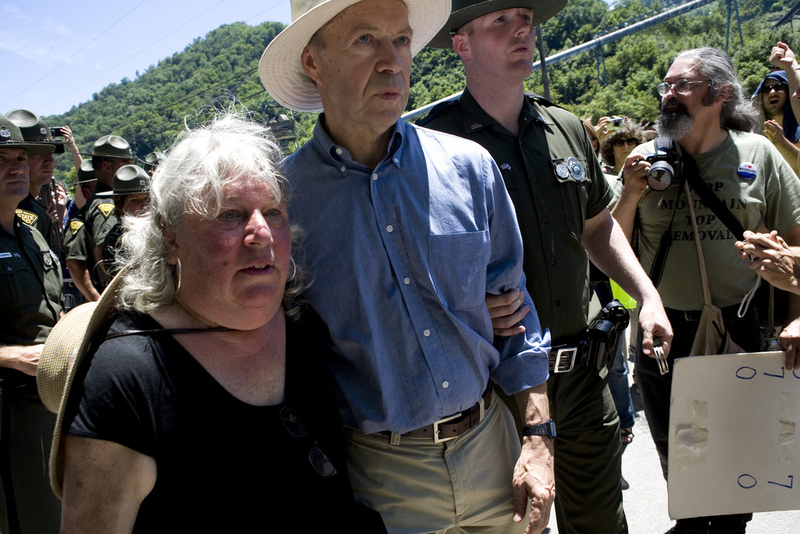 NASA climatologist James Hansen (center) gets arrested at West Virginia anti-coal protest yesterday. Hundreds of anti-coal/anti-mountaintop removal activists gathered for a historic protest in Coal River Valley, West Virginia yesterday. The top headlines are that NASA climatologist James Hansen, actress Daryl Hannah and 94-year-old former WV congressman Ken Hechler were among 30 arrested for sitting down on a highway outside of Massey Energy, the leading mountaintop removal coal mining company. A large number of coal supporters also showed up and were described as being aggressive toward the other rally participants. Coal River Mountain Watch co-director Judy Goldman was reportedly hit in the face by a Massey supporter, who was apprehended by police just before attempting to assault a coal miner’s widow/community activist. –Charleston Gazette staff writer Ken Ward Jr. blogged about the action, raising the point that both sides of the coal debate could claim a victory yesterday. This leads to a number of important questions, namely “So what next?” but also, “What about the miners? Who can argue that they don’t have a right to stand up for their jobs and their families?” The Gazette blog offers some good analysis. –Robert Kennedy Jr. helped rally protesters for the yesterday’s action while at the Bonnaroo music festival in Tennessee over the weekend, telling the crowd, “Let’s get arrested!” However, I haven’t seen any reference to him being at the protest. –James Hansen has agreed to debate Massey Energy President Don Blankenship later this week. -Hansen also wrote a plea to President Obama to put an end to mountaintop coal mining. how tall is Daryl Hannah? she is a very tall lady isn’t it?~;. I was just looking for this info for a while. After six hours of continuous Googleing, at last I got it in your web site. I wonder what is the Google’s problem that does not rank this kind of informative web sites closer to the top. Generally the top web sites are full of garbage.